Why isn’t the Portfolio Manager investing my funds faster? Bondora investors often ask why their Portfolio Manager is not investing funds or investing at sufficient speed. The reason is the popularity of the higher rated loans. Naturally, many of our investors are eager to fund borrowers with a less risky credit profile. Resultantly, the AA, A, and B rated loans are exceedingly popular. With competition for these investments so high there are only so many opportunities to go around. As we recently discussed in our latest portfolio performance review, the AA and A rated loans, which are available only in the Estonia market, have since Q1 of 2015 delivered realised net returns of 12,59% and 12,08% respectively. This combination of a substantial return and lower risk is attractive to all our investors. B rated loans in Estonia and Finland for the same period has generated realised net returns of 15,04% and 7,39% respectively. To better understand the relationship between the supply and demand of high-rated loans, we calculated a variable that reflects the bid competition for each rating. Simply put, we take the total number of bids made per rating and divide by the total winning bids per rating. In the graph below, the steep decline of this curve represents the strong competition to fund higher rated loans versus those carrying more risk at the right side of the graph. Most notable in this data is the big drop in demand between AA and A rating. The other takeaway is that higher competition starts with the B rating. The competition factor can be loosely divided into two groups – high competition for AA, A, B rating loans and lower competition for C, D, E, F, HR loans. For investors this means that the likelihood of getting invested into AA-B rating loans is better when they raise the bid sizes in their Portfolio Manager settings. 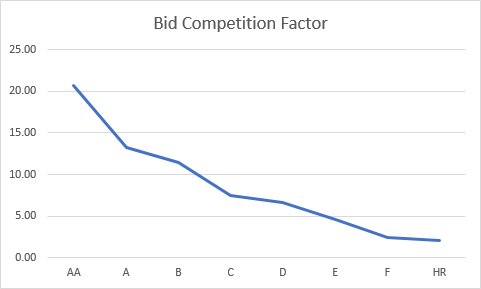 Portfolio Managers with minimum or small bid sizes trying to invest into AA-B or even C rating loans often tend to be pushed to lower position in the investment priority list, being outbidded by higher bid amounts. As a result, lower bids are left out of the investment. This is why some investors may experience their Portfolio Managers not investing their funds in desired speeds. The best strategy is to stay in the market and adjust your Portfolio Manager strategy or settings.